Extensive research demonstrates that SEL programs improve well-being, reduces problem behaviors, supports academic achievement gains, and develops skills critical to success in college and career. As defined by the Collaborative for Academic, Social and Emotional Learning (CASEL), Social Emotional Learning (SEL) is the process through which children and adults acquire and effectively apply the knowledge, attitudes, and skills necessary to understand and manage emotions, set and achieve positive goals, feel and show empathy for others, establish and maintain positive relationships, and make responsible decisions. Accurately recognize emotions, thoughts, and behaviors. Successfully regulate emotions, thoughts, and behaviors. Take the perspective of others, including those from diverse backgrounds and cultures. Establish and maintain healthy and rewarding relationships. Make constructive choices about personal behavior and social interactions. We’ve teamed up with Aperture Education to offer the DESSA System, an assessment and intervention system featuring the nationally recognized Devereux Student Strengths Assessment (DESSA) and DESSA-mini. In addition, Kickboard users can now integrate social emotional learning assessment through the new DESSA SEL Inventory, a curated set of 40 behaviors related to the DESSA’s eight evidence-based social-emotional competencies. Read the blog post "What is Social Emotional Learning (SEL)?" Kickboard’s real-time behavior tracking platform is an essential component to social emotional learning monitoring and assessment. Educators can quickly and easily record students’ demonstration of key SEL skills and Kickboard’s robust reporting platform provides flexibility for analyzing and reporting on SEL skill and behavior data. Track and analyze real-time data on SEL skill use: Choose SEL skills to track and measure across the entire school year or focus on different skills on a weekly, monthly or quarterly basis to correspond with specific SEL units of study. 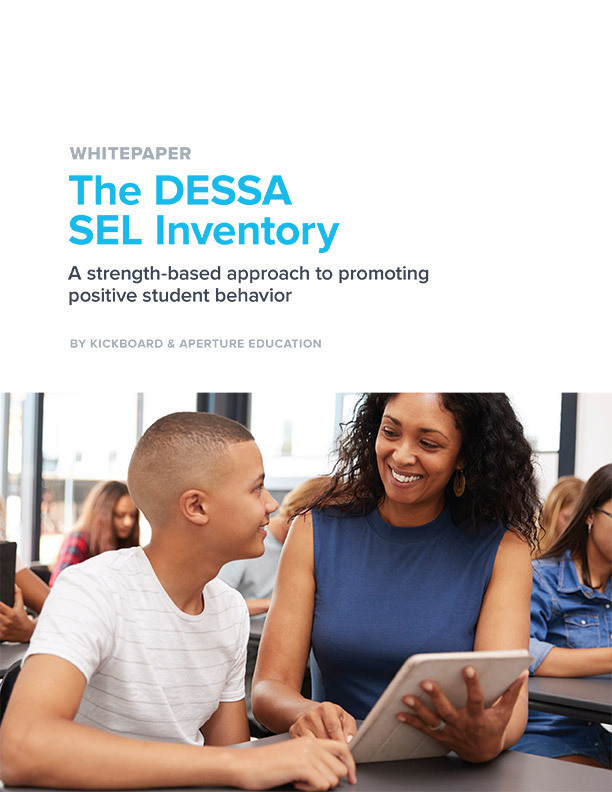 Align SEL and PBIS programs: Include items from our new DESSA SEL Inventory in PBIS behavior tracking to connect SEL instruction with PBIS behavioral systems and structures. Include SEL skills in intervention plan monitoring: Identify and track demonstration of targeted SEL skills as part of behavioral intervention plans. Integrate evidence-based SEL assessment and intervention: Add the DESSA System from our partner Aperture Education to access the nationally recognized DESSA social emotional learning measure, corresponding intervention strategies, and select lessons from leading SEL programs. Use Kickboard to assess student development with your social emotional learning curriculum. Which SEL skills are students frequently demonstrating? Which SEL curriculum areas might you need to revisit? Kickboard complements any SEL program by enabling teachers to gather and analyze data on student development of SEL curriculum skills. Watch a 1 minute overview of this easy-to-use behavior capturing tool.